I almost embarrassed myself. More than usual. I was ready to make fun of the Hudson Bay Post, dubbing it the Delta Force of online news because it didn't exist, at least according to the first link I tried. It calls itself Churchill's monthly newspaper, published occasionally by a privately owned publishing house and "chock full of not-necessarily-true-stories about not-so-late-breaking news but the cover always looks great! 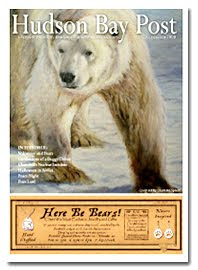 Its website polarbearalley.com features facts and fiction about the northern icon and landscape. "It is a strip of white sand beach along the coast of Hudson Bay near the former site of the Churchill garbage dump. A beautiful place for a picnic if you know how to handle a shotgun." It caters to a niche audience that's interested in northern travel, facts about the area and tall tales. Just when I think it doesn't have much to teach about digital journalism, its website is updated far more often than some mainstream news sites. I didn't expect to find a lesson in the polar bear capital. That's the beauty of travelling online, especially when it's already snowing there and I haven't even taken my woolies out of storage yet.